This past weekend Tom made the trip to Ohio for Father’s Day. The celebration was a feast from Struther’s legendary Elmton Pizza, and his Uncle Gary showed up with four quarts of ice cream from Handel’s. When you think of four quarts of ice cream, you think four different flavors, but when Handel’s is involved, Youngstown locals know to get two quarts of the signature Chocolate Ice Cream with Pecans. 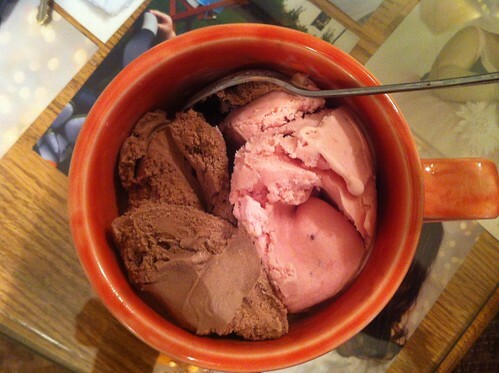 The other flavors were Cookies & Cream and Strawberry. Check out their full menu here. 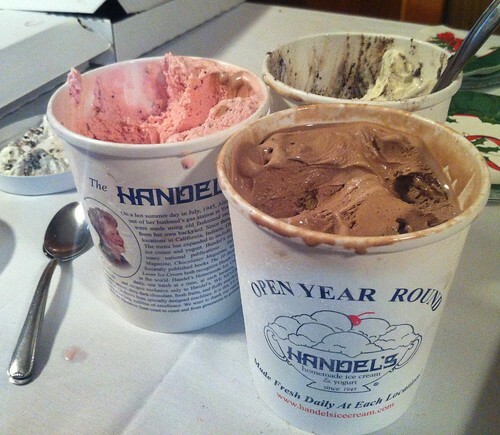 Handel’s makes classic ice cream that satisfies both the pickiest foodies and children a like. Bill Cosby is said to have a monthly standing order with Handel’s Ice Cream, and rumored to have it sent to friends as gifts. Once you taste it you’ll know why. While salted caramel might be the trend now, Handel’s added salty pecans into their chocolate ice cream years ago and found that savory-sweet spot we all crave. It is now the classic flavor that the locals rave about and visitors find themselves loving. 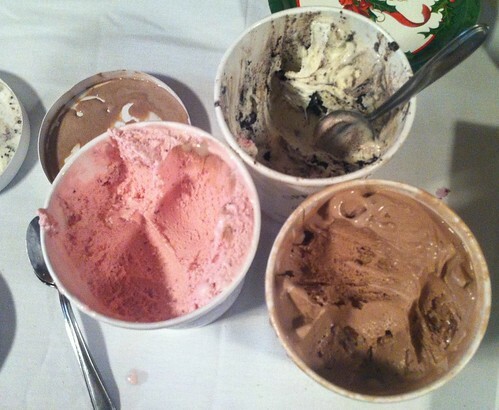 All three flavors that Tom tried were delicious, but his last Ohio meal was Strawberry and Chocolate Pecan. As we get older, Oreos are a flavor turn off. This bowl of a makeshift 2/3s neapolitan had Handel’s signature pecans to upgrade it to an adult treat and was the perfect way to end a trip to Youngstown, Ohio. This entry was posted in Reviews and tagged Chocolate Pecan, Cookies & Cream, Handel's Homemade Ice Cream & Yogurt, Ohio, Strawberry, The Elmton, Youngstown by Tom. Bookmark the permalink.